Most Samoan kids grow up eating this. It's a treat for breakfast or any time of the day. You can eat this hot or cold, out of a bowl or a mug, lightened with coconut milk or cow's milk - the ingredients are completely variable according to taste. * You can use any white rice - long, medium or short-grain - but the consistency will vary per rice type. Long-grain will give you clearly separated grains that sink to the bottom of the bowl. Short-grain produces the thickest consistency, like chocolate rice pudding. * Laumoli is a leaf from an orange tree. Just pick the leaf, rinse it under water and throw it whole in the pot. I guess you could substitute grated orange rind or orange essence. By the way, the laumoli is just for flavour. Don't eat it. * There are no hard and fast rules about when to add the Koko Samoa. 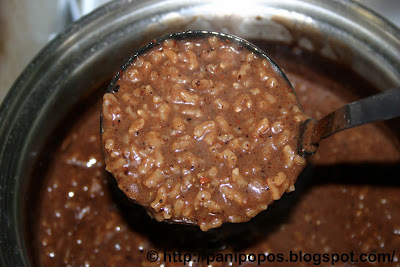 My mother throws in a whole lump of koko at the beginning and by the time the rice is cooked, the koko is softened and distributed evenly throughout the pan. You can also cook the rice up first with the water, then add the koko near the end. The important thing is to give the koko time in the hot water to release it's flavours and oils and yummy goodness. If you don't have Koko Samoa, you can substitute any high-quality unsweetened cocoa powder. * In place of the coconut milk, you can use normal milk. * And finally, don't judge me ok? 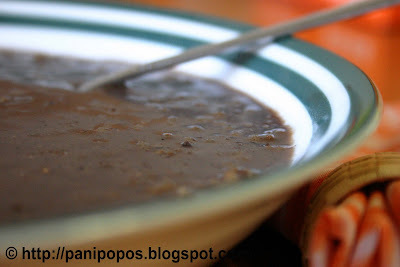 But koko araisa tastes really good with thick slices of generously buttered white bread. WooHoo!!! Thanks for putting this recipe up! I have been waiting my whole life for it, well ever since I discovered its yumminess over 16 yrs. ago :) Thanks again, I can't wait to try it! Do you have a recipe for Vaisalo?? I can't remember how my grandmother made it.. but I've been craving it for a while now.. Keep up the good work..
Hi Norma, yes, everyone makes koko araisa a little differently, but it always tastes great. I think you need coconuts for Vaisalo and unfortunately, they don't grow round these parts. Thx for the encouragement. My 3rd grade son is having an international luncheon at his school this week and he chose to make a dish from Samoa. We practiced making Koko Araisa this afternoon and it came out amazing! We love it! He already declared he'll be having it tomorrow for breakfast! We hope to actually visit Samoa one day, and taste the 'real thing' :) Thanks so much! Hi Tali, thx so much for your comment...Really happy your son loves koko araisa...It's one of my alltime favourites...Hope his classmates enjoy it too! Aww...this recipe brings back memories. 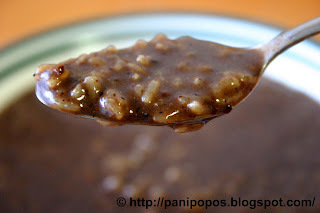 I remember when I stayed with my grandparents once when I was a little girl and I woke up in the morning for breakfast my granddad had made Koko Araisa. He told me it was better than coco pops, of course I found that hard to believe until I hesitantly tasted it, and it was a love affair with koko araisa that I have never forgotten. Hi Cherie, what a sweet story...that honestly brought a tear to my eye..."better than cocopops"?...Your grandad had it in a nutshell. Happy cooking! hi! long time no post from me, i know:) been so busy(and tired) getting ready for the baby's arrival-soon, very soon! but today it's gloomy outside and don't have any energy to cook so i thought, tonight it's coco rice! with french bread and lots of butter of course:)i just know my family will love it- thanks! Hey there! Great to see you here...sounds like a top meal - koko araisa and bread...It must be like carrying a basketball right about now, can't see your feet or fit behind the driving wheel etc., so good luck with the delivery and when you get back, hopefully I'll have my kopai recipes up...take care! Thanks for sharing this! After years of eating my mothers koko alaisa I've now made my own to share with my family! Love your work! I want my kids to grow up eating what my mother fixed us when I was growing up. Thank you so very much for sharing! If I just listened when I was younger to my mother maybe I too would have known how to make all of these yummy dishes. Now I do, Thanks to my newest favorite blogspot "Panipopos"! Hey Grace, thanks for your comment...Definitely try to share our wonderful Samoan food with your kids...It's such a beautiful part of our culture...Happy cooking (and eating)!! You can substitute unsweetened cocoa powder...I haven't tried Milo so don't know how that would turn out...Good luck! thank you for helping me to share fa'a Samoa with my American friends. i gave some of them the koko Samoa now they can learn from your website and the beautiful pictures and videos. Hi Justin, I can't think of a more fitting gift than a classic taste of Samoa...thank you for sharing it with your friends! I had a friend that would make this with left over white rice when we'd order chinese. How would you modify this recipe to do this? I've been craving it for a long time. When we use leftover rice, we usually just freestyle it with the rest of the ingredients...but for a general guide, 1 cup uncooked rice gives you 2-3 cooked cups so if you use that amount of cooked rice, then the rest of the ingredients should be the same as above. hey panipopos who was the first person to make koko laisa? Hello! 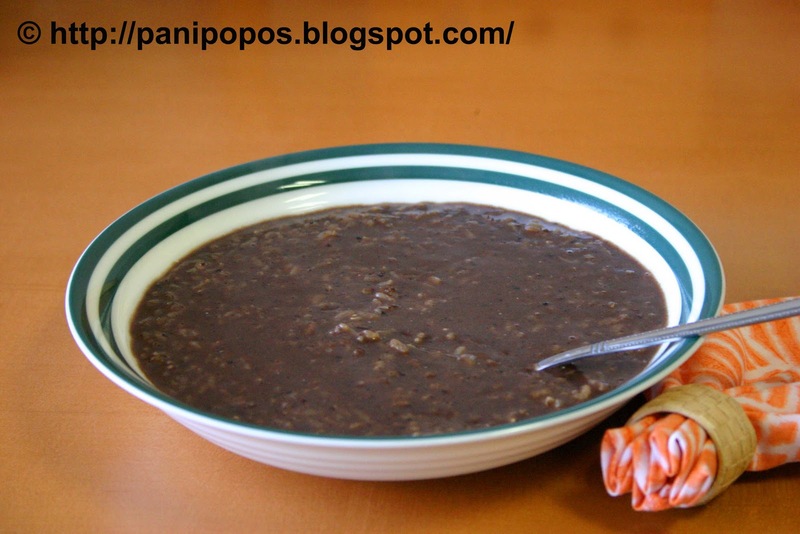 This is very similar to what we have in the Philippines, called champorado. 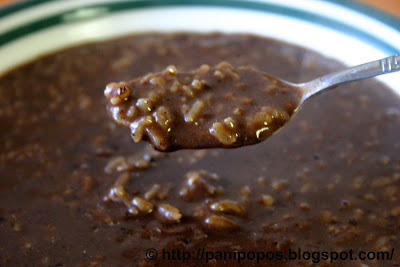 :) like rice porridge, but with cocoa. Thanks for sharing! I consider myself an expert in kokoalaisa making, as my whole family likes it when I cook it. How much cocoa goes in the pot depends on the amount of water as too much cocoa will make the taste of the kokoalaisa too strong. I would say about 2 oz of cocoa for every ten cups of water with the rice in a pot. I agree that cocoa must be put in the pot with rice and water at the beginning when you start cooking it so by the time it's ready the cocoa is well blended in the hot water and the cooked rice. The rice must not be overcooked and it should be ready about 3 minutes just after the water is boiled. I usually throw in sugar when the water is boiled with the coconut cream only added together with the lemon leaves when you turn off the oven. The laumoli or lemon leaves should be the green ones and not the baby ones, because your kokoalaisa can taste odd if you put in the baby lemon leaves. Hope that helps. Thanks for the recipe!